A few months ago, our household got caught up in the Fidget Spinner craze. Maxwell spent many hours perfecting his Fidget Spinner tricks however over the last week, Maxwell has moved onto something else. Maxwell has moved onto the MOKURU Desk Fidget Toy. Launched today in the UK the MOKURU Desk Fidget Toy is set to take over the UK. The MOKURU Desk Fidget Toy is a wooden desk toy - lightweight Beech wood peg with rubber ends, engineered to test a person's focus. The toy is built perfectly so it has a fantastic balance. The toy is a perfect toy to learn flips and tricks and learning to do these things takes time and a lot of patience. The MOKURU Desk Fidget Toy helps improve concentration and hand-eye coordination skills for individuals of all ages. The design of the MOKURU Desk Fidget Toy is sharp and sleek. At first when using the toy, I thought that the toy may get damaged easily however the toy is built well and so far, the toy has not got one mark on it through play. The MOKURU Desk Fidget Toy comes in a range of colours. You are able to pick bright colours and plain colours however the black and red design which we were sent is our favourite colour combination. The MOKURU Desk Fidget Toy is a toy which can be taken on holiday, shoved in a bag to take to school and a toy which can be used at home. Due to its small size, it is a toy which is never going to take a lot of room up. The MOKURU Desk Fidget Toy is a toy which would be fantastic for multi play and a toy which is suitable for all ages to have fun with. It is also a toy which is not messy and a toy which does not require batteries. The MOKURU Desk Fidget Toy is a toy which will bring entertainment to its owner each time it is used. Every time you use the MOKURU Desk Fidget Toy, you are not guaranteed to be able to perform a trick or move the same as you have created before. 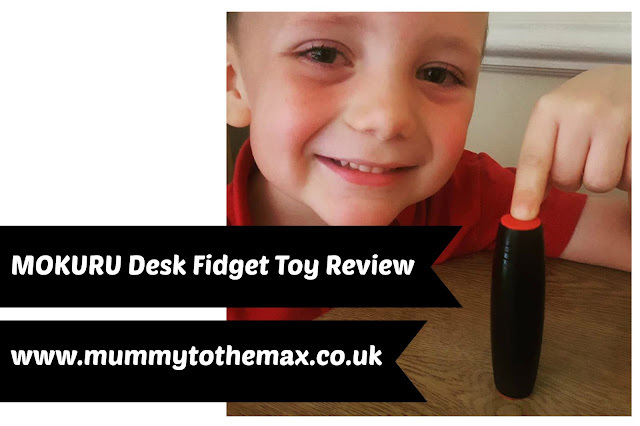 As a parent I found the toy easy to use and I found it was easy to explain to Maxwell how to use the MOKURU Desk Fidget Toy. As a 5 year old Maxwell adores the toy and it is a toy which he will use over and over again. When Maxwell uses the toy, he is determined to carry on using it until he has managed to perform a trick he wants to create. Overall as a family, the MOKURU Desk Fidget Toy is a toy which all of our family love and we feel this toy will bring a lot of entertainment to other families. When buying this toy, ensure that you get the official one. There are a lot of fakes currently on the market. Mummy To The Max is now giving its readers the chance to win a MOKURU Fidget Toy. There are 3 to be won! To be in with a chance of winning, all you simply need to do is enter the rafflecopter below. Good Luck! *We received the MOKURU Desk Fidget Toy for the purpose of this post. All thoughts and opinions are of my own.